Fitness by Chris Finley: Get Fit Playing Cards! Seriously! Believe it or not, you CAN get fit playing cards even if you don't have much time! These aren't your typical card games but they are ways to make your workout a little more interesting. It should also be noted that these a once-in-awhile thing. If you do it all the time it will probably get old. This is one of my favorites. With this game you use the cards to determine which cardio exercise you will do. To play, choose four cardio exercises that you can do for 1 minute non-stop. Each exercise gets its own suit. Shuffle the deck and lay out some cards FACE DOWN. If you want a 10 minute workout, put 10 cards out. If you want 20 minutes, put 20 out. The number on the card doesn't matter for this one. The first card you flip is a 4 of clubs so you do 1 minute of jumping jacks. You flip over the next card to reveal an ace of diamonds so you shadow box your imaginary opponent - bobbing, weaving, and jabbing for the next minute. And so on. If you are really short on time or just want a harder workout you can do Interval Card Cardio. The only difference, go as hard a fast as you can for 30 seconds then rest for 30 seconds and flip the next card. You can also choose harder exercises to really burn some calories! :) Make sure you monitor yourself with this one though! You can push pretty hard but if you get dizzy or light-headed, ease up a little and let your heart rate come back down. It probably wouldn't be too wise to perform each for 1 minute. It would be pretty tough if you flipped 2 or 3 spades in a row. That would mean 2 or 3 minutes of push ups! Instead, perform repetitions to match the number on the card. Say you flip a 5 of clubs you perform 5 repetitions of squats, then an 8 of hearts means you perform 8 reps of band pulls next. Ace and face cards are 10 reps.
As I was coming up with ideas for this article I came across Fit Deck. They are special decks of cards with exercises and explanations on each. They even have different decks for different interests. 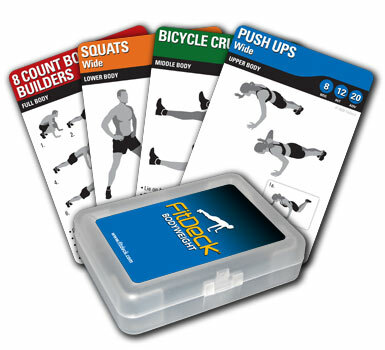 Basketball Fit Deck, Soccer Fit Deck, Yoga Fit Deck, even a nutrition Fit Deck! Shuffle up and have some fun!